Royal Green Coconut sugar is produced from the sweet sap of the tropical coconut blossoms. Traditional sugar farmers climb high in the coconut tree and harvest the sweet nectar from the blossoms. Once collected, the nectar changes by slowly heating into a delicious rich sugar. Royal Green coconut blossom sugar is 100% certified organic and the ideal replacement for refined white sugar, cane sugar, beet sugar, agave, ahornor any other syrup. Coconut blossom sugar is rich in Potassium, Magnesium, Zinc, Iron and is a natural source of vitamin B1, B2, B3, B6 and C.
100% certfied organic coconut blossom sugar. 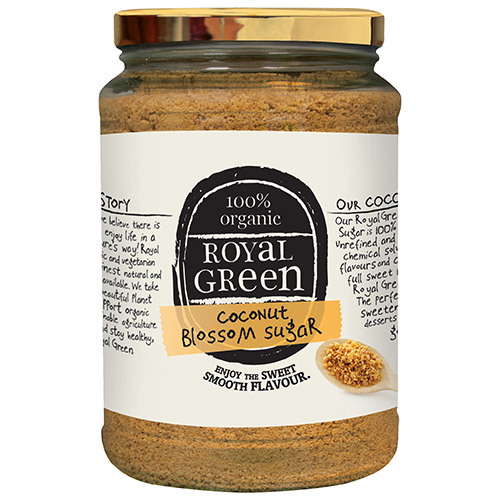 Royal Green Coconut Blossom Sugar is the perfect alternative sweetener for drinks, desserts and baked goods. Use the same amount as you would with any other sugar. 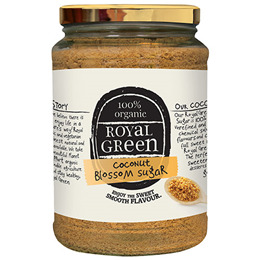 Below are reviews of Royal Green Coconut Blossom Sugar - 900g - Best before date is 24th June 2019 by bodykind customers. If you have tried this product we'd love to hear what you think so please leave a review. Royal Green coconut blossom sugar is 100% certified organic and the ideal replacement for refined white sugar, cane sugar, beet sugar, agave, ahorn or any other syrup.